Tokyo is Japan's largest domestic and international hub for rail, ground, and air transportation. 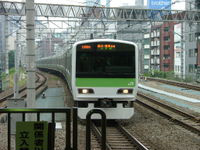 Public transportation within Tokyo is dominated by an extensive network of clean and efficient, if often very crowded trains and subways run by a variety of operators, with buses, monorails and trams playing a secondary feeder role. Railway stations are not only transport, but the center of Tokyo and Japanese urban life, as everything is judged in relation to it, taking on the significance of highways in the United States and elsewhere. Within Tokyo, Tokyo International Airport ("Haneda") offers mainly domestic flights. Outside Tokyo, Narita International Airport, in Narita, Chiba Prefecture, is the major gateway for international travelers. Rail is the primary mode of transportation in Tokyo, which has the most extensive urban railway network in the world and an equally extensive network of surface lines. JR East operates Tokyo's largest railway network, including the Yamanote Line loop that circles the center of downtown Tokyo. Tokyo Metro and Tokyo Metropolitan Bureau of Transportation operate the subway network. The metropolitan government and private carriers operate bus routes. Local, regional, and national services are available, with major terminals at the giant railroad stations, including Tokyo and Shinjuku. Expressways link the capital to other points in the Greater Tokyo area, the Kantō region, and the islands of Kyūshū and Shikoku. Taxis operate in the special wards and the cities and towns. Long-distance ferries serve the islands of Tokyo and carry passengers and cargo to domestic and foreign ports.